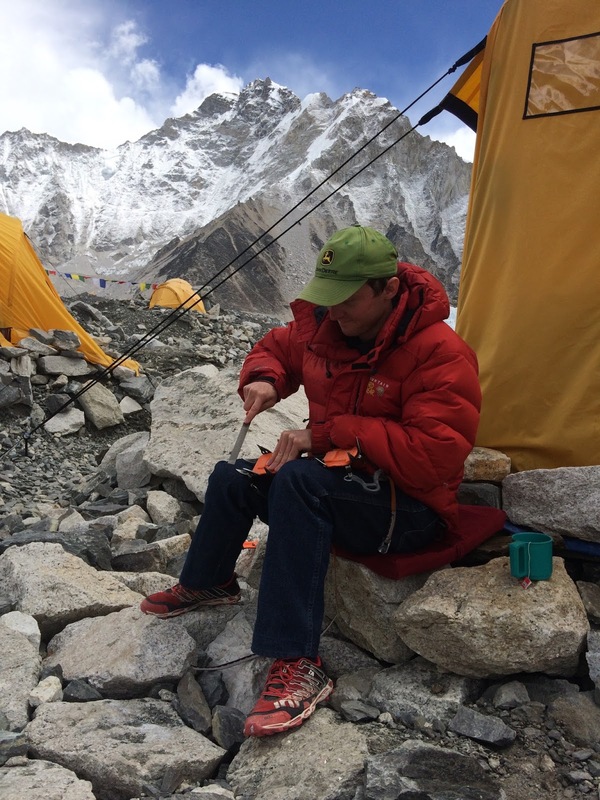 I brought a file to Nepal to sharpen my crampons at Everest base camp before the summit push. Crampons get dull when you walk over rocks, which isn't is a huge part of mountaineering, maybe 2-3% of the mileage on Mt. Everest, while you are wearing crampons. It's the kind of thing that builds up over time. Usually I use my crampons one day here, two days there, maybe three days in a week in Colorado. An expedition however involves a lot of days on the mountain, I spent 19 days, at least part of the day, above base camp on Everest 2016. Three of those were rest days at camp two, so not using crampons, but the other 16 had crampons, and I walked over rocks on every one of those days. Point being, bring a file because in that many days your crampons can get dull. So before the summit push, my first one, I got the file out and sharpened my rather dull crampons. I think I was the only person on our expedition that brought a file. Two people borrowed it to sharpen their crampons, and two others used it to take pictures, as if they were sharpening their almost new crampons. Several of my teammates, people who would be summiting Everest in a week and a half commented that I was "a real mountaineer" and I didn't know how to respond to that. It's Mt. Everest, the tallest mountain in the world. 1-2% of people that attempt it die. You had better know your gear and be prepared. So I guess I'm a real mountaineer now. I suppose that means I can put red laces on my mountaineering boots now. Or perhaps it means I am doomed to be single for a long time. Or perhaps it means Mt. Everest was the 9th hardest thing I have ever done, we may never know.